All four Moore children were murdered in their beds in this bedroom on June 10, 1912. Could this orb be the spirit of one of the Moore children? This 2005 infrared video footage was taken by PRISM founder David Pierce Rodriguez from a window sill in the children's bedroom of the Moore residence. As a PRISM investigator approaches the door to the children's bedroom, a mysterious orb flies towards our trigger item. Our trigger item was a dress, similar to the one a young turn-of -the-century girl would have worn to go to church. The Moore and Stillinger girls would have been wearing their Sunday best before they went to sleep on the night of their unfortunate deaths. The vintage dress can be seen hanging in the center of the closet. On June 10, 1912, sometime between the hours of 12:00 am and 5:00 am, a string of gruesome murders took place at the J.B. Moore residence in the small town of Villisca, Iowa. This would soon come to be known as the worst mass homicide in Iowa history. The eight victims, all bludgeoned to death, were Josiah B. Moore (age 43), his wife Sara Moore (age 39), their children Herman (age 11), Katherine (age 10), Boyd (age 7), and Paul (age 5), and two guests in the home, Lena Stillinger (age 11) and Ina Stillinger (age 8). The murder weapon was located by police; it was a large axe owned by Josiah Moore. The axe was found in a small bedroom downstairs, propped up against a wall, next to the dead bodies of Lena and Ina Stillinger. There were many suspects in this gruesome murder, but no one was ever charged, and the case remains unsolved to this very day. The J.B. Moore residence, currently uninhabited, is known as a hotbed of paranormal activity. The current owner has restored the home to the way it looked in 1912 and, for a small fee, rents the house out to anyone who dares to spend the night. The Villisca Axe Murder House has been investigated by many ghost hunters and paranormal investigative teams from all around the Midwest. Many have spent the night in this house and reported similar experiences. Some of these experiences include the feeling of a heaviness reported around the main stairwell of the house and a strange change in appearance in the upstairs bedrooms at night. Various video and still shots have been taken with orbs and light trails appearing in them, and numerous electronic audio phenomena (EVP) have also been captured in the house. The real thrill ride of a night spent at the Villisca House begins around 2:00 am. It is at this time of the night when a train passes through the town of Villisca. The whistle of the train is thought to trigger the residual events of the murder that took place on June 10, 1912. It is widely believed that the killer(s) used the masking sound of the locomotive to sneak throughout the house and murder all its inhabitants, one by one. Many investigators have noticed a light fog filling up the master bedroom at the point when the train whistle is first heard. This fog moves from room to room, just as the killer(s) might have. Once the fog dissipates, it is followed by the sound of dripping blood. The J.B. Moore home was added to the National Historic Register in 1997. Steven Laursen Jr., 37, was critically injured early Friday during an overnight stay at the Villisca Ax Murder house. The paranormal investigator stabbed himself in the chest while spending the night at a “haunted” Iowa house made infamous for an unsolved ax murder 100 years ago that left eight people, including six children, dead. Robert Laursen Jr. ended his visit to the Villisca Ax Murder house in southwest Iowa early Friday with critical stabbing injuries that the Montgomery County Sheriff’s Office say were self-inflicted. It’s unclear how the 37-year-old man visiting from Rhinelander, Wisconsin managed to stab himself, but authorities said he was there “for a recreational paranormal investigation” when cops got the call around 12:45 a.m. Laursen was eventually flown for treatment to an Omaha hospital, some 80 miles northwest of the small Iowa town. Martha Linn and her late husband Darwin purchased the home in 1994 and have hosted paranormal investigators “all the time,” Martha Linn told the newspaper. "They all hope something will come to them. ... Sometimes they like to tempt fate,” she said. VICE (11/18/14): Linn and Sampson say that Laursen has recovered from his injuries, but will not comment any further out of respect for the family. This video includes audio analysis, using the latest 3D spectrogram software, to compare various Electronic Voice Phenomena (EVP) of the Moore and Stillinger children, captured on both digital audio recorders and video cameras at the Villisca Ax Murder House, located in Villisca, Iowa, by four separate paranormal research teams. Over a 10 year span, PRISM has recorded many Class A EVP of children sounds that we believe to be the the deceased Moore and Stillinger kids. The same spirit/ghost voices of these children have been recorded by other paranormal teams, on different recording sources, and on different dates. Great EVP audio comparisons from ORBS, Smoky Valley Paranormal, and Rachel M. Jones, confirm that we are all recording the same children! If we are all recording the same children's voices, it must be proof that the dead can speak. PRISM's 10-year long EVP research into the children's voices being recorded at the Villisca Ax Murder House was examined in an iHorror.com article entitled, Dead Villisca Children Speak After 100 Years, written by journalist Timothy Rawles. On April 11, 2014, PRISM returned to Villisca for another overnight investigation. On August 30, 2013, PRISM returned to Villisca for another overnight investigation. Meeting at the Villisca Cemetery at about 3:30pm we paid respects to the Moore and Stillinger families and then proceeded to the Ax Murder House where we met Martha Linn and Johnny Houser. After visiting with them for a short while we went on a tour of the house and then proceeded to start setting up equipment. Throughout the night the temperature remained around 100 degrees farenheit, due to this, we made the decision to use the air conditioners. (On the left) 3 consecutive photos taken in the parlor on an Olympus 8MP digital camera by PRISM investigator Michael Beacom. A shadow can be seen descending near the front door in the darkened parlor. This type of photgraphic anomaly happens quite often when taking photos in the Moore house late at night. (On the right) Two zoomed enhancements of the dark section of Photo #2. Carl was feeling something in the room and that something can be seen on the chair. The original photo can be seen here. A larger version of the enhancement can be seen here. Present at the investigation were: Carl Norgard, Dottie Norgard, Kelley Kennedy, Larry Kennedy, Lisa Krasso, Nicole Crockett, Michael Beacom, Cassandra Beacom, and guest investigator John Powers from the UNO Paranormal Society. EVP #3VOICES - Recorded by PRISM investigator Nicole Crockett. An object can be heard falling to the ground. Immediately afterwards, the faint whisper of PRISM investigators can be heard from a nearby room. Over the background chatter, a child's voice appears. Note that there were no children present at the investigation. EVP #CRYING - Recorded by PRISM investigator Nicole Crockett. You hear the PRISM investigators talking about how they felt in the room, saying, "I can feel the breeze again" and "It hurts". This is immediately follwed by the sound of a child. EVP #PULL - Recorded in the children's bedroom by PRISM investigator Kelley Kennedy. You first hear some items being moved around near the recorder, then the EVP, followed by a PRISM investigator saying, "Pull really hard". On August 30, 2013, PRISM spent another night at one of our favorite haunts, the Villisca Axe Murder House. The amount of evidence captured at the house was phenomenal. This photo was shot on an Olympus 8MP digital camera by PRISM investigator Michael Beacom in the parlor room. Is this the ghost of one of the Moore children? 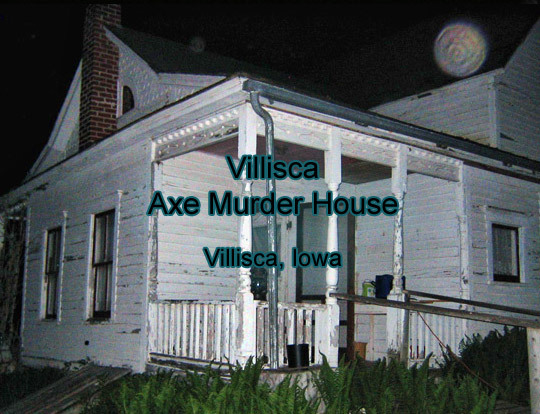 PRISM investigated the Villisca Ax Murder House on May 7, 2005 along with author Troy Taylor (American Hauntings) and Ursula Bielski (Chicago Hauntings). Video footage from May and September 2005. Paranormal activity recorded in the 2nd floor children's bedroom of the Villisca Axe Murder House, recorded by the PRISM team. The closet door can be seen opening and closing on its own, on command. PRISM was featured in the Villisca Ax Murders 2008 documentary film A Ghost of a Chance by JEK Films. PRISM founder David P. Rodriguez and paranormal investigator Anney Horn were interviewed about their experiences at the Villisca Axe Murder House. The documentary is a behind the scenes look at the making of the film Haunting Villisca by AriesWorks Entertainment and can be found on the Haunting Villisca DVD set. EVP #TIME - This EVP was recorded by PRISM founder David P. Rodriguez on an Olympus W-10 digital audio recorder on May 8, 2005. The digital audio recorder was located in the childrens' bedroom on the second floor of the house. In the recording a camera is heard, then PRISM investigator Anney Horn coughs. This is followed by the sound of child sighing. David then asks, "What time are we supposed to leave here anyway? ", and Anney responds "I don't know". Immediately after that, two distict children's voices can be heard talking over eachother. One child clearly says, "get in here", but what the other child is saying is unknown. David and Anney continue to talk, while children continue to be heard talking. David and Anney did not hear these children, they were only heard later, after listening back to the recordings. Note that there were no children allowed on the investigation. All sounds of children heard in this recording are deemed to be paranormal in nature. EVP #WHOA - This EVP was recorded by PRISM founder David P. Rodriguez on an Olympus W-10 digital audio recorder on May 8, 2005. The recorder was located in the children's bedroom on the second floor of the house. A click can be heard then two children can be heard talking. One says, "He's gonna hurt us" and immediately afterwards another child says, "Paul". That is followed by PRISM founder David P. Rodriguez saying, "Whoa, that was a good one ...misty! ", in reference to a photograph that had just been taken showing a mist in the attic that was not visible to the naked eye. EVP #SWEETY - This audio clip was recorded on videotape, in the doorway to the second-floor attic, right outside of the children's bedroom, at 1:41 am on September 10, 2005 by PRISM investigator Anney H. on a video camera. Immediatley after PRISM investigator Anney Horn asks, "Hey sweety, can you close the door?" a child's voice can be heard saying what sounds like, " Do it again. Lena, you do it." The source of the clicking sound heard in the middle of the EVP is unknown. EVP #WHORU - This audio clip was recorded in the kitchen of the Villisca Axe Murder House by PRISM investigator Dan Christianson on a Sony ICD-B300 digital audio recorder on May 27, 2006. A child's voice can be heard saying what sounds like, "Who are you?" There were no children allowed on the investigation. This video shows 3D audio analysis comparisons of various Electronic Voice Phenomena (EVP) recorded at the Villisca Ax Murder House in Villisca, Iowa by two different paranormal research teams, PRISM and ORBS, and on different dates. We are both working together to try and figure out if we are all recording the same childrens' voices. Could these voices really be the Moore children? Be warned, that the EVP recorded by our friends at ORBS is chilling! This audio clip could very well have captured the residual sounds of the murder still emanating throughout the house on that gruesome night in 1912. This photograph was taken by PRISM founder David P. Rodriguez in September 2005. A brown shadow appears in the photo taken of the attic located on the second floor of the house across from Joe and Sarah Moore's bedroom. 2005 PRISM investigation of the Villisca Ax Murder House in Villisca, Iowa 2005. Reporter Dave DeJohn and videographer Jason Pressler joined PRISM on an overnight investigation of the jail. Presented by news anchors Taylor Wilson and Tracy Jacim on KPTM Fox news in Omaha, Nebraska. At least 3 Moore children can be seen in this photograph taken by MPR on a 35mm camera in the kitchen of the Villisca Ax Murder house in 2005. The children were murdered in their home in 1912. This photograph was taken by PRISM investigator Anney Horn on September 10, 2005. Mysterious lights appear around PRISM sensitive Karen Copeland while in the main bedroom located on the second floor of the home. It was in this room that Joe and Sarah Moore were found murdered. This photograph was taken by PRISM investigator Dan Christianson on November 19, 2004. A strange light anomaly appears on this photo which was taken of the stairway located in the first floor kitchen. This photograph was taken by PRISM director Carl Norgard on September 9, 2005. A snake-like light anomaly appears on this photo which was taken in the first floor parlor.